Grandmother of five Yeoh Kim Bee is not your average senior. Since May last year, the 82-year-old retiree has been doing CrossFit once a week with 10 other seniors. It involves challenging exercises such as kettlebell swings and step-ups. She also takes part in hip-hop dance classes and has been doing yoga for seven years. "I've always liked exercising because it's good for my body," Yeoh told The Straits Times in Mandarin on Tuesday. "My whole family loves exercising. My son would always ask me to exercise and go swimming with him." She added that her family enjoys cycling and swimming. Yeoh, who lives alone, walks from her flat to the House of Joy, an elderly activities centre in Mountbatten, for her training. The class is designed to suit the elderly, with the intention of giving them the confidence to lead independent lives. "I exercise not only for myself but also for my family. If I am healthy and fit, then my children won't have to worry about me," she said. "It's better if I can take care of myself." The hour-long class begins with a light warm-up and stretching, followed by basic movements like squats. It moves on to technical movements such as burpees and a high-intensity workout to get the participants' heart rate up. It ends with a cool-down and stretching. 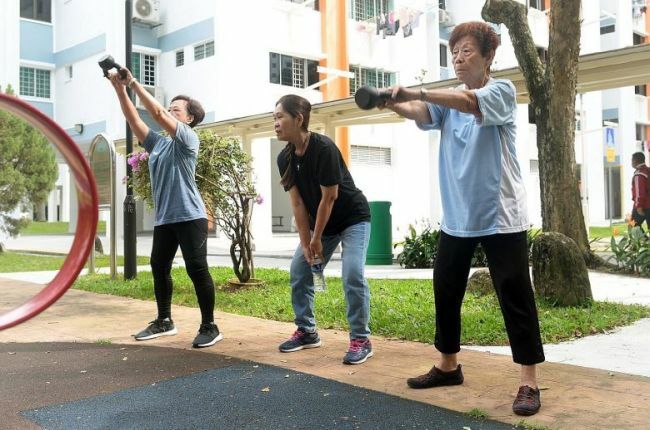 Innervate Fitness director and trainer Lionel Choong, 30, said: "This programme trains the seniors' physical capacity to encourage them to do things that they fear to do, like burpees. "The more they do these movements, the more confident they will get, allowing them to lead more free and happy lives." It was implemented last May with the intention of offering more interesting and exciting programmes for the elderly in the neighbourhood. Choong has seen the seniors progress from learning how to do a basic squat to almost being able to do a full burpee. "A lot of them were scared at first but, their confidence and physical capacity have grown tremendously," he said. House of Joy programmes executive Victor Wong, 34, said: "The goal is for the elderly to live out their golden years. They need good muscle mass and bone density to remain healthy but most seniors don't eat well and don't exercise." Yeoh has been active all her life. When she was younger, she was in her school's sports club, where she did high jump and long jump. She hopes to continue exercising for as long as possible. After completing 22 CrossFit classes, she has adapted to the rigours of the programme and finds that she feels a lot stronger now. "I would definitely encourage other seniors to take part in CrossFit because it keeps you fit and energised. You will also be able to make a lot of good friends through taking the classes together," she said. Tomorrow, Yeoh will be among 500 other people participating in Operation Broken Wing, a CrossFit charity event. The annual event, organised by Innervate Fitness, aims to raise funds for at-risk youths in Singapore. For every repetition a participant completes, their chosen sponsor will donate a fixed amount of money. This year, the funds raised will go to the Singapore Children's Society. Having never participated in a fitness-related charity event before, Yeoh is excited to do her part for the community. "I will definitely do my best and complete as many repetitions as possible," said Yeoh, who will be joined by five other seniors from the House of Joy. "These are people who need help but, they are helping others and to me, that's really fascinating," said Choong.